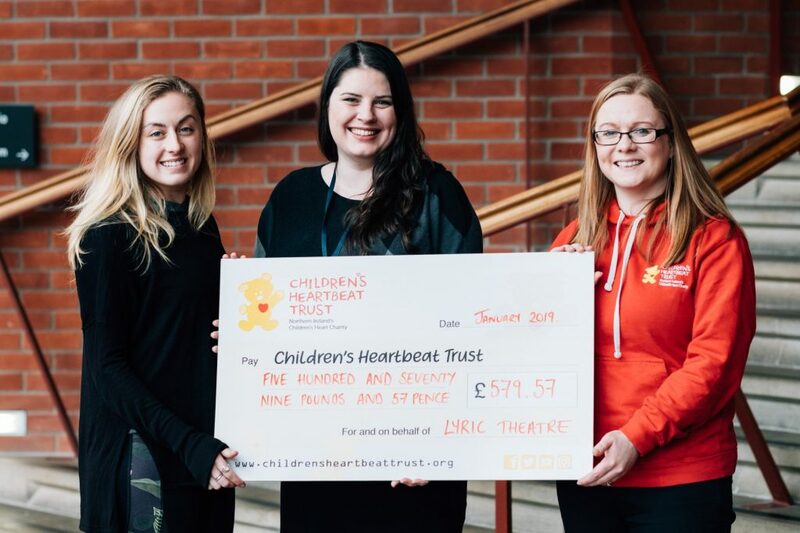 The Lyric theatre chose the charity as partner for their festive show, Alice: The Musical. Through a charity collection at the show and sale of Alice:The Musical CD £570.57 was presented to Lynn from the charity. 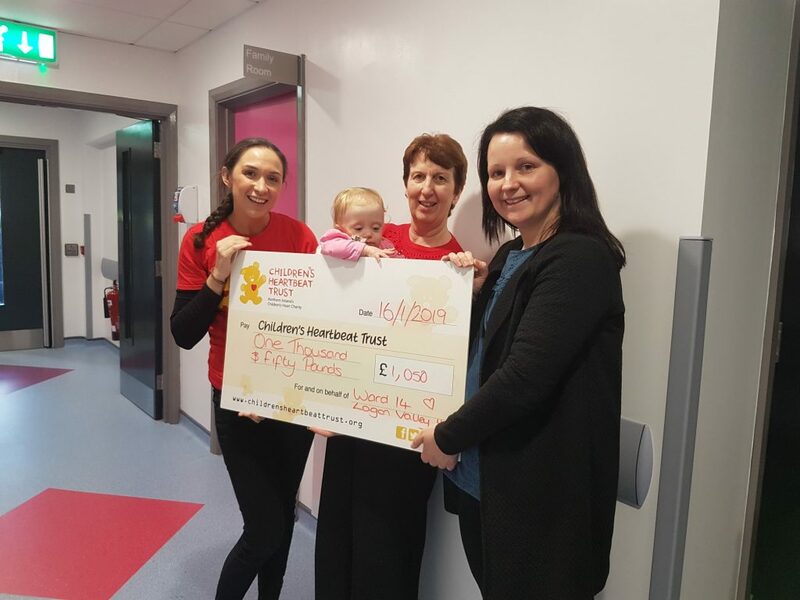 Cathy is pictured with little Aimee, granny June and Mum Kate receiving a cheque for a cool £1,070. June works on Ward 14 in Lagan Valley Hospital and raised this fantastic amount through Christmas hamper sales. 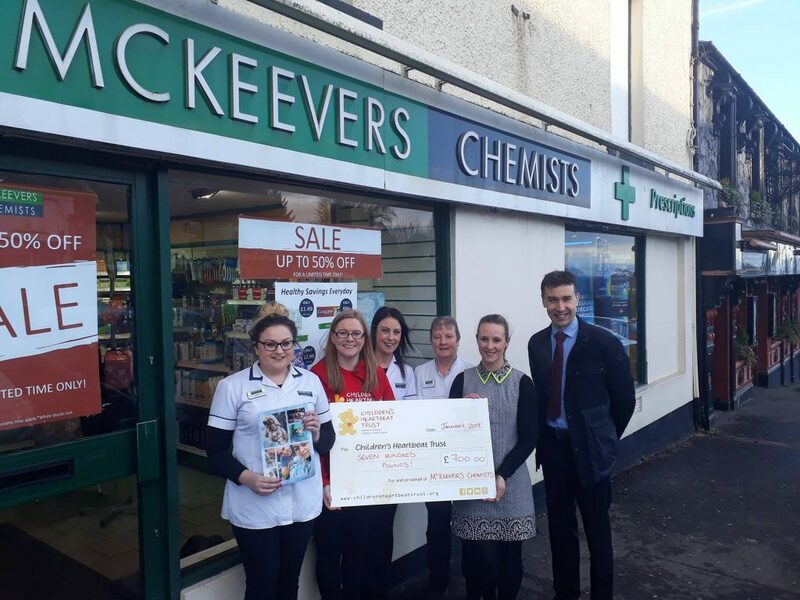 Paul McKeever, owner of McKeevers Chemists along with staff from his Castlewellan branch present Lynn with a brilliant cheque for £700. They held a christmas jumper day across their Newry, Kilkeel, Castlewellan and Newcastle Stores. 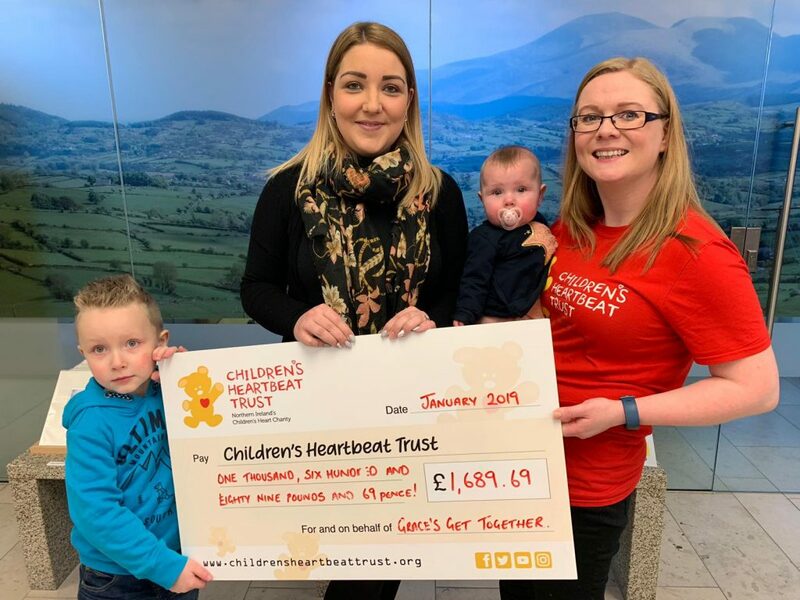 Melissa Irvine is pictured with her son Harley and daughter Grace presenting Lynn with a generous cheque for £1,689.69. 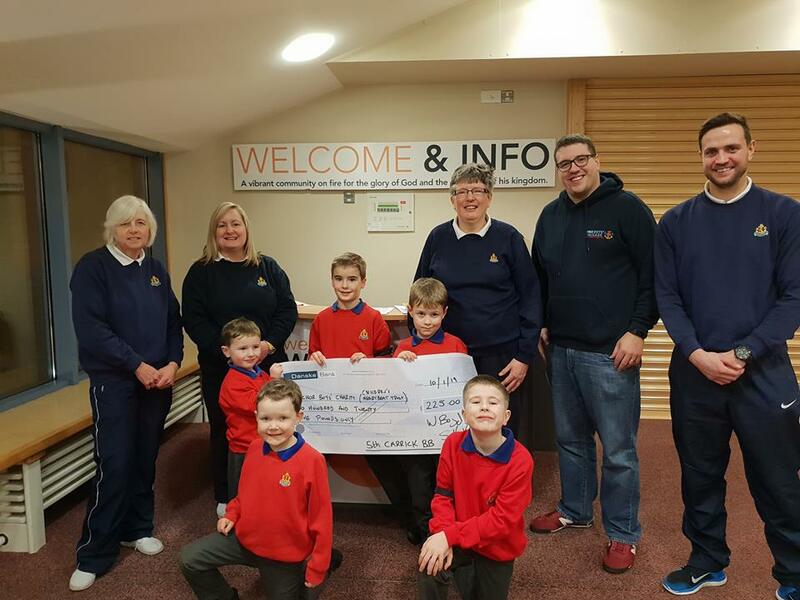 They held Grace’s Get Together in Loughbrickland to raise these wonderful funds. 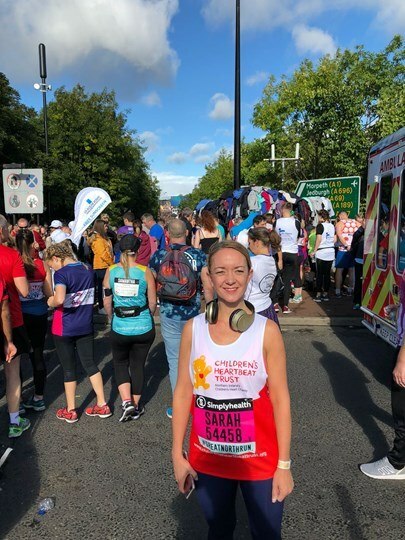 Sarah Murray took part in the Great North Run raising an amazing £1,938.75 for the work of the charity! 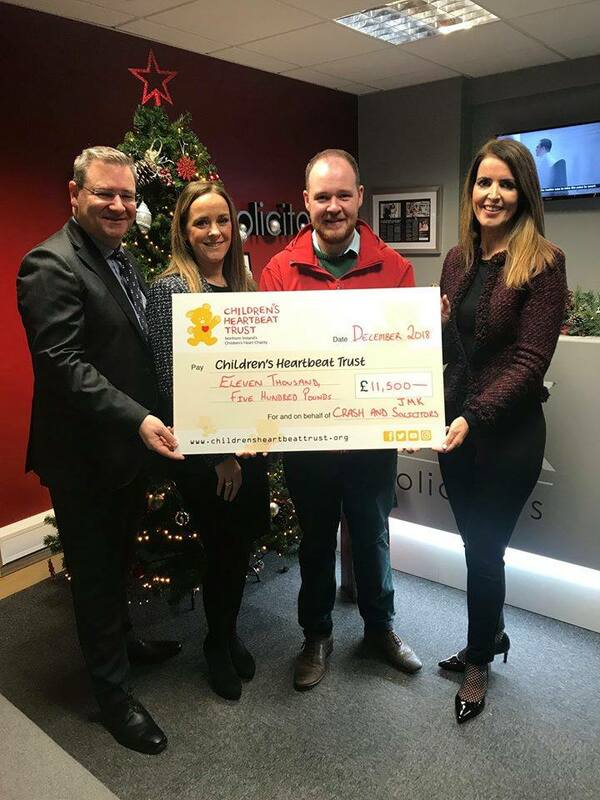 David Boyle, the Caring Caretaker from Coleraine presents Sarah, David and AnnMarie from our Coleraine Family Group with a fabulous cheque for £7,000. 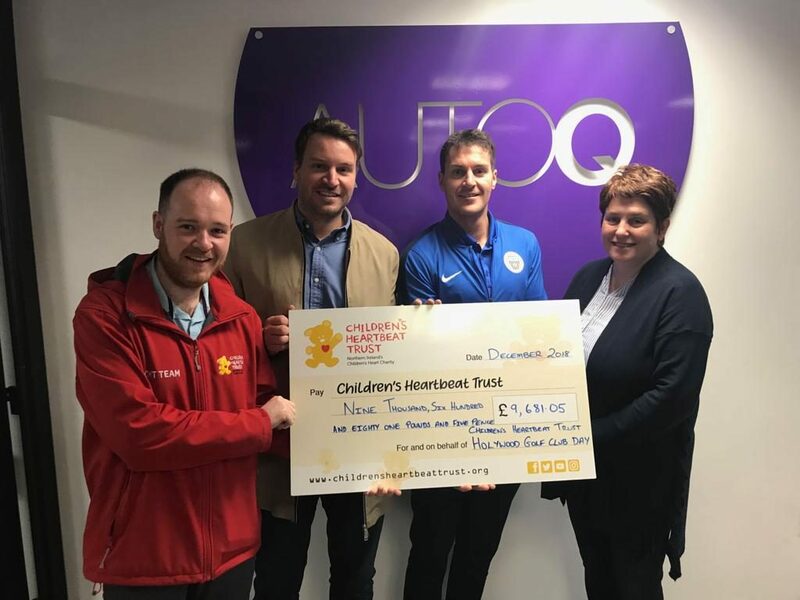 David chose us as one of his 6 charities to support in 2018. Funds were raised from various activities including his annual Caretaker Sit Out at Christmas. Members of Dunboe Anchor Boys, Articlave present David with a cheque for £485.43. 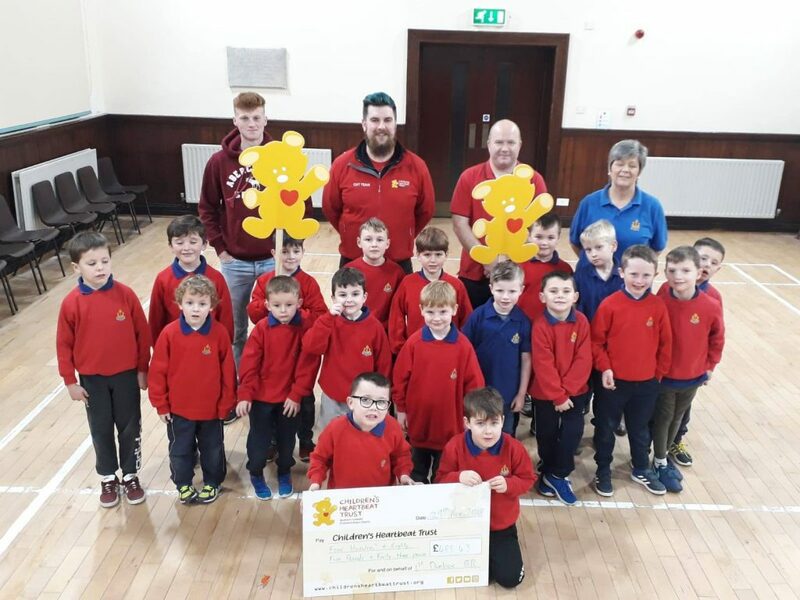 The boys took part in a sponsored walk to raise funds for CHT, which has been selected as the Boys Brigade Charity of the year! Woodlands Presbyterian Church Anchor Boys. This money is party of the Anchor Boys year long charity fundraising for Children’s Heartbeat Trust. 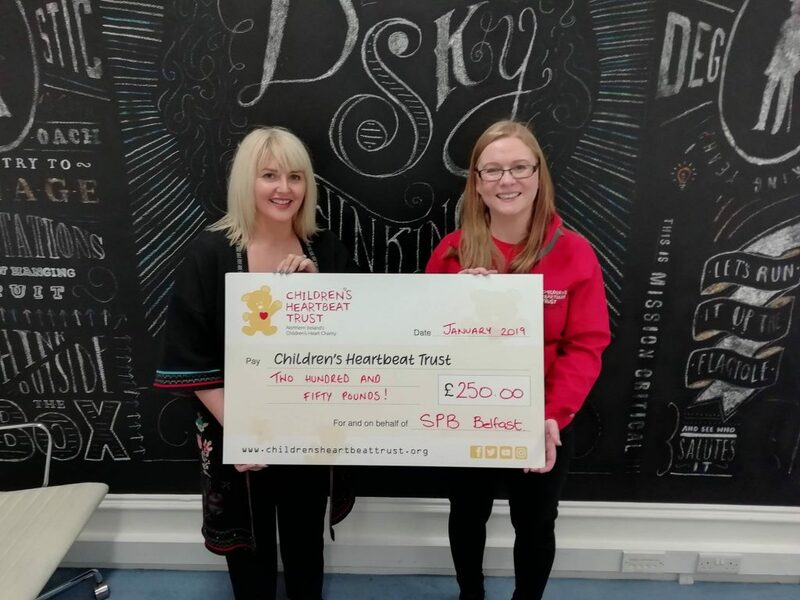 We were delighted to be chosen as charity of the year for JMK solicitors and CRASH in 2018. Gareth was delighted to be presented with a cheque totalling £11,500 from their year long fundraising! Staff held coffee mornings, dress down days, big breakfasts, a night at the races and took part in the Belfast Marathon during the year. 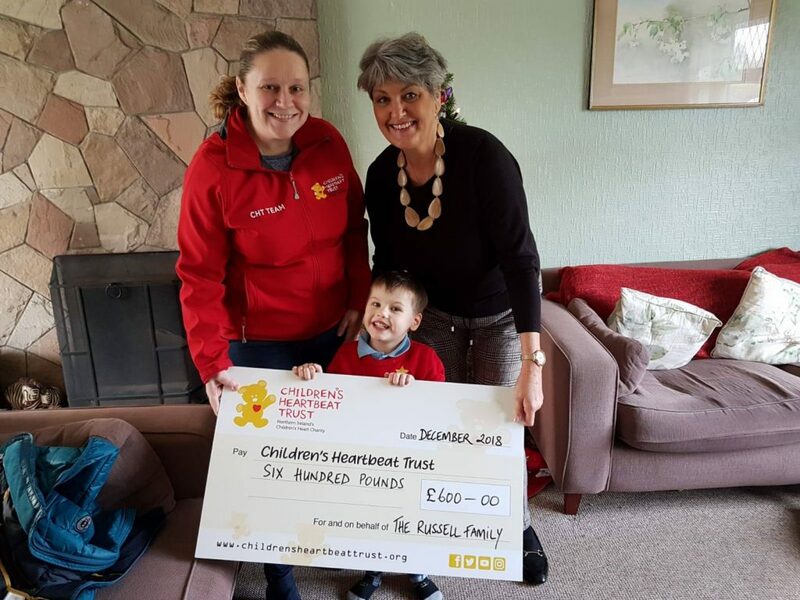 Alison is pictured with Oliver and his granny Joy presenting a cheque for £600. The money was raised through the sale of honey, kindly donated to the family by William Millar of Ballyblack Bees. 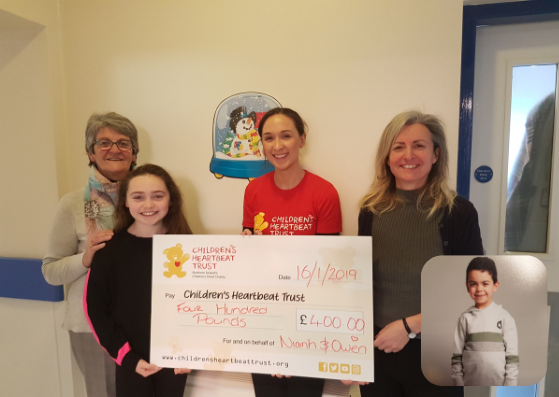 Pictured are Roberta McCrum, Niamh Smith and her mum Gillian presenting Cathy with a cheque for £400. Niamh raised £100 doing a carol service with her hockey team – Armagh Hockey Club. Her Granny Roberta also raised £300 in lieu of gifts for her 70th Birthday. She chose CHT because her grandchildren, Niamh and Owen (pictured) have both been supported by the charity. Unfortunately Owen couldn’t make the photo. 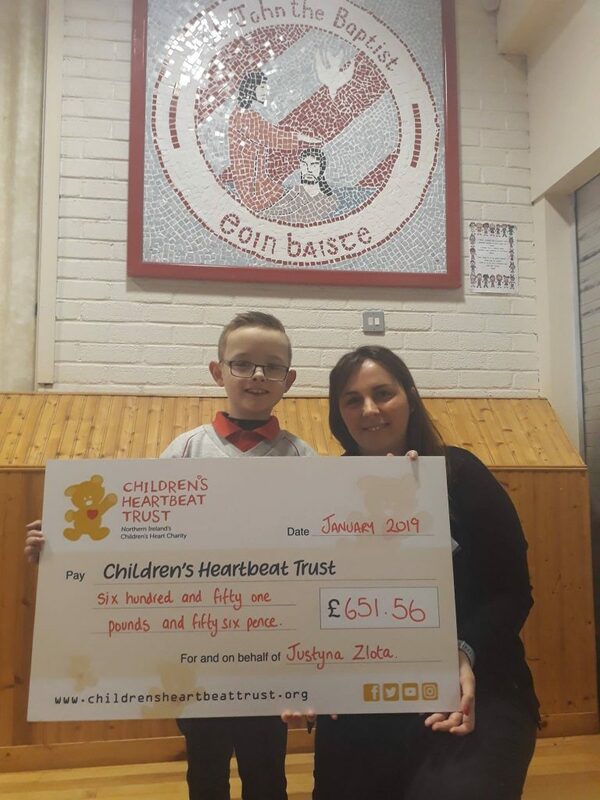 Justyna Zlota-Chodkowska and Harry Farrell present a cheque for £651.56. Justyna ran for Harry in the Cultra Run to raise money for the charity! 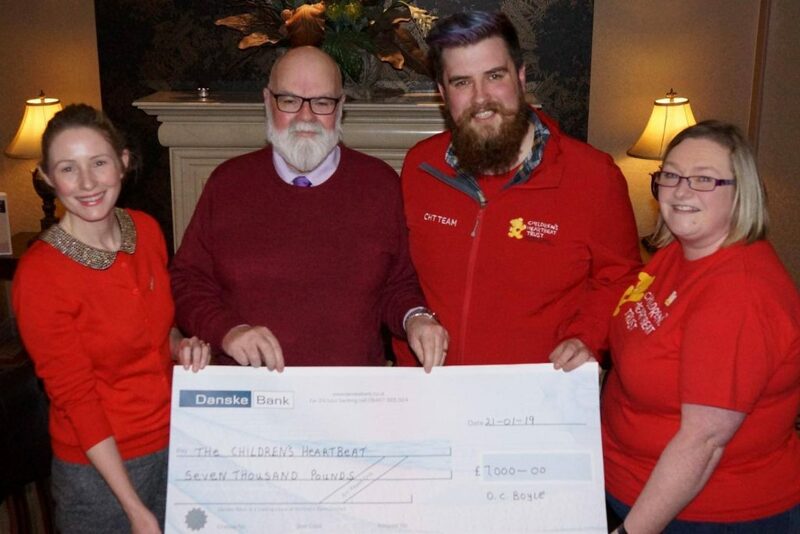 Craig, Ricky and Jean on behalf of Holywood Golf club present Gareth with a cheque for £9,681.05. The money was raised from their annual golf day in aid of the charity which has now been running for 6 years.  Thankyou for your continued support! 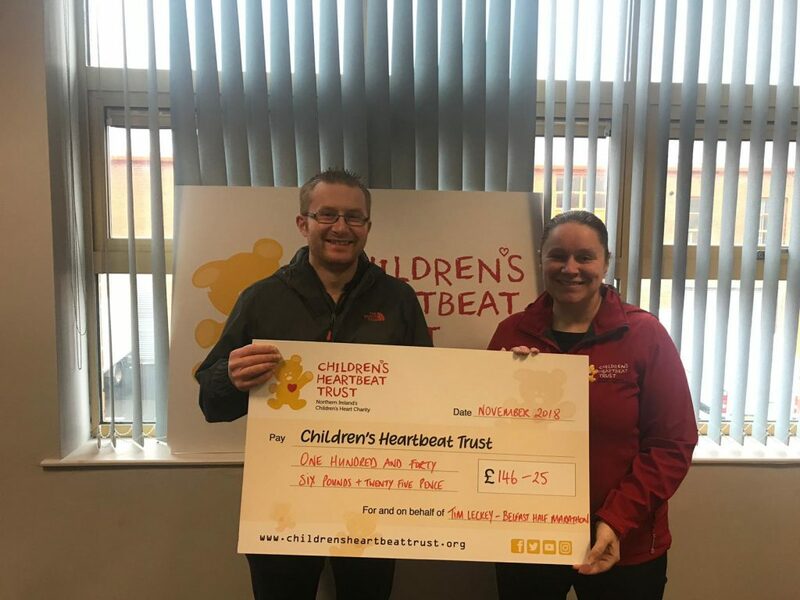 Tim Lecky is pictued presenting £146.25 to Alison. Tim took part in the Belfast Half Marathon to raise funds for the charity. Thanks TIm for your continued support to our work! Donna presents £250 to Lynn on behalf of the Scottish Provident Building in Belfast. They raffled a hamper at Christmas to raise funds for the charity. 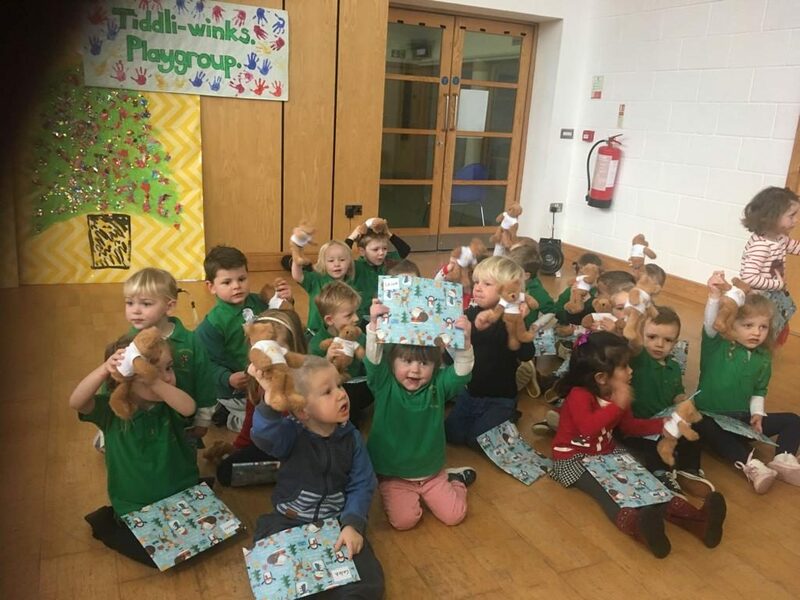 Kids from Tiddli-winks Playgroup in Bangor raised £208 from donation in lieu of Christmas presents for staff. Thank you! 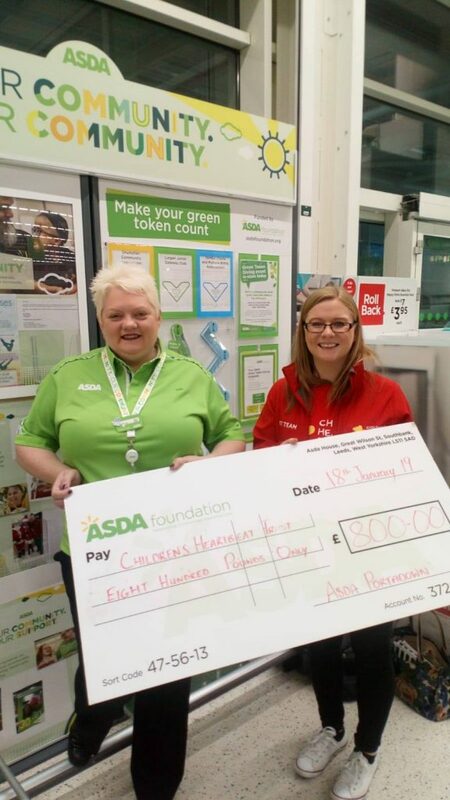 Elaine from ASDA in Portadown presents Lynn with a cheque for £800. Staff members took part in the Santa Dash at Christmas to raise funds and also received a top up donation from the ASDA Foundation.